I had a $5 ECB that expired soon that was part my $25 CVS Gift Card Challenge with my free $25 CVS gift card from Swagbucks, so I had to spend that much at CVS this week...turned out to be harder than you'd think! Haha! Thankfully with combining ECB deals, printable coupons, scanner coupons, and email coupons I spent it and came out with even more ECBs then I went in with! I was excited to see that I got $3 ECBs back from the cards I was buying with the coupon-I found out you could actually do it 3 times, for a total of $9 ECBs, although I didn't do that here. This is shopping trip #4 in my CVS gift card challenge. My $25 CVS gift card earned on Swagbucks plus extra bucks and cash back earned on purchases made with it total $38.33 worth of CVS spending power and have purchased $86.91 worth of products. See the spread sheet below for details of my current totals. 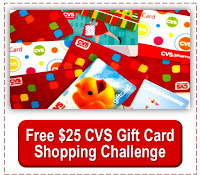 Check out all of my shopping trips in the Free CVS Gift Card Shopping Challenge by clicking the image below. The toothpaste will be used in our church's food pantry.